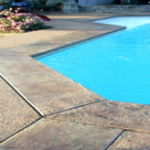 Stamped concrete is a method of using mats, stamps, rollers, or templates to impart a specific texture to the surface of the concrete, usually in an effort to mimic some other material. 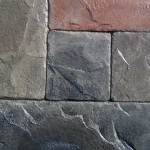 Natural slate, cut tile, brick, fieldstone, cobblestone, and pavers are only a few of the options available. 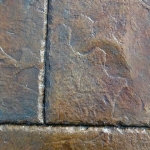 To enhance this effect, the concrete is also pigmented using a variety of methods. 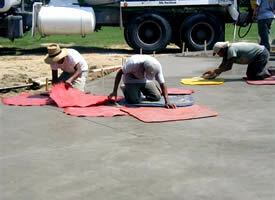 Baltz and Sons Concrete invests considerable time and resources to researching, developing and improving methods of stamped concrete. 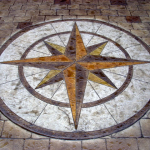 Not only have we designed some of our own specialized tools, but we have developed proprietary methods of stamping, pigmenting and especially, staining concrete — the resulting body of work has garnered dozens of first–place state titles for decorative concrete, including several grand championships and has been the subject of several local media, including CONCRETE DÉCOR MAGAZINE, MEMPHIS MAGAZINE, MIDSOUTH LIVING, and the Commercial Appeal. Always stepping up to a challenge, Baltz and Sons Concrete continues to produce singularly unique and decorative projects in applications that demonstrate the versatility and beauty of concrete. Stamped concrete allows the home-owner to achieve the cosmetic appeal of a more expensive material with the structural benefits, speed, function, and versatility of concrete — all at a fraction of the cost. It is easily one of the most cost-effective ways to add a signature character to your project.